You can fly to San Francisco or Oakland International Airports. Cheap airlines tend to fly to Oakland, such as Alaska Airlines, Southwest Airlines and jetBlue. Even United flights are often cheaper to Oakland. From Chicago, ATA is often the cheapest, flying to San Francisco. Also check out Frontier Airlines, Midwest Express and National Airlines flying to San Francisco. From SFO Airport, the easiest way to get to UC Berkeley is to use the door-to-door shuttle Bayporter Express. It is now possible to take BART (Bay Area Rapid Transit, a local train system) from SFO to Downtown Berkeley. From Oakland Airport, you get the bus, Airbart, to the Colliseum/Oakland Airport BART station. Then take BART for Richmond, and get off at Downtown Berkeley station (not North Berkeley). See also public transportation to UC Berkeley. 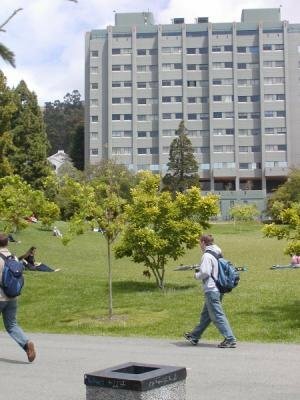 You can walk from BART station to UC Berkeley campus (see Map of the campus; BART station is in C1), or can use campus shuttle. Door-to-door shuttle Bayporter Express can take you to Berkeley from the Oakland Airport. For a comprehensive list of other airport shuttle services visit http://www.bayareashuttles.net. Driving is not recommended in Berkeley because parking and traffic can be a nightmare. Public transportation is recommended. Nonetheless, here are driving directions to campus. 1.6. Evans Hall (as in picture, though seen from other side) will be on your right about 1/3 mile into campus. 2.3. When it passes the SW corner of campus, Oxford becomes Fulton St.
2.4. Channing Way crosses Telegraph Ave after two blocks; continue on Channing as in 1.3 above. 3.2. Turn right/North on Telegraph Ave, and continue as from 1.1 above. Note: when visiting the Berkeley campus by car during working hours one should, in general, park on a nearby street or in a commercial lot, as there is no public parking available on campus. However, the Department can usually arrange one-time parking for invited visitors.